Being a Good Mum. - Who's the Mummy? I have, from time to time, written on this blog about being a bad Mum. But today I think maybe, just maybe, we’re doing okay. Flea’s taken to writing stories and diaries recently. She’s decided she’d like to be an author or a screenwriter when she grows up (she told me last night her favourite thing about The Muppets movie was that it ‘breaks the fourth wall’). 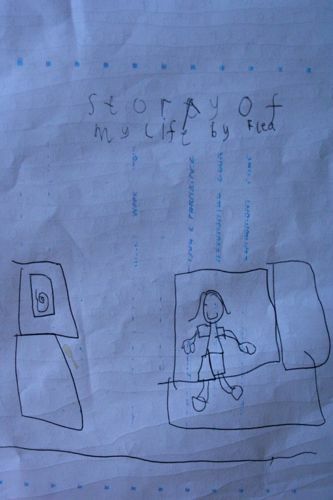 Anyway, this morning I found “The Story of My Life, by Flea” on the dining table when I came home from the school run. So, yeah, my child might be a bit late, and just a bit crumpled. She may sometimes have toast crumbs down the front of her blazer. But she’s basically just really happy. How cool is that? Next Post What should be on your child’s to-do list? That is AWESOME. You’re doing a great job! That’s fab, Sally – you don’t need to ask for any more. I know, it made me smile. That is wonderful, indeed. Can we swap? I usually get ‘poo poo’ and ‘I hate you and Daddy and Eleanor and Wesley and I everyone in the world’. Right. I think I’m going to ban breakfast and homework (don’t iron so I have a head start there) and book a trip to New York. Do you think that will work? Oh dear. I would certainly try that, even if it doesn’t work, you’ll be happier. Oh love… and more surprises to come!!! Clearly you are doing a great job!!! Well, I got very lucky with Flea, I must admit! I’m so impressed by that, there’s literally no better gift as a mother than hearing something like that. It also makes me feel better that I rarely iron either! It’s just the best feeling to think your kids are happy, isn’t it? THAT is very VERY cool indeed. You are obviously getting it absolutely right. That is super cool – and who says the odd crumb and being crumpled makes a bad mother??? That’s brilliant. I’d be well chuffed with that! She certainly is – and thanks! Made me cry ! Obviously being an evil overlord is the way forward as an example to us all. well that is just fab! Oh. I bet even YOU welled up a le-e-e-tle bit. How amazing is that? I love that and your daughter does sound pretty amazing! I would put myself at the same place as you in terms of mothering (I have a very similar story of my 8 year old son seeing someone iron) but also realise I’ve not done a bad job of dragging him up! Indeed, it’s nice to be able to see they’re doing okay despite the dodgy parenting, I think. WOW, what an awesome diary… And has clearly inherited a gift for writing, you’ll let us know when her first novel is published, won’t you? Ha! the girl does love a good story. That’s super cool 🙂 Love the new look blog too. Just adorable, and I’m sure she is right! I’m still tinkering, need to sort out the feeds this week, I think. Hmmm, no acknowledgement of the “made me want to give you a big hug” part. It’s great isn’t it – I suspect all of us just want to think our children are happy. The problem is that there is that we have this idea if what a good mother is. How can there be one size fits all? Sounds like you’re doing a bang up job to me. That finishing line is just brilliant. I think the girl needs her own blog. Mirka Moore @Kahanka recently posted..Light – The Gallery! Very sweet! Can I take a leaf out of your parenting notebook? Aww a really lovely post. It sounds like you’re doing a brilliant job. I don’t think of parenting as a learning curve more like a learning vertical line! That is awesome. Just about the best thing you could hear from your child. It made my heart sigh. Hey Buddy!, I found this information for you: "Being a Good Mum.". Here is the website link: https://www.whosthemummy.co.uk/being-a-good-mum/. Thank you.